As you may know from my last post I was out on a little country drive on Friday. 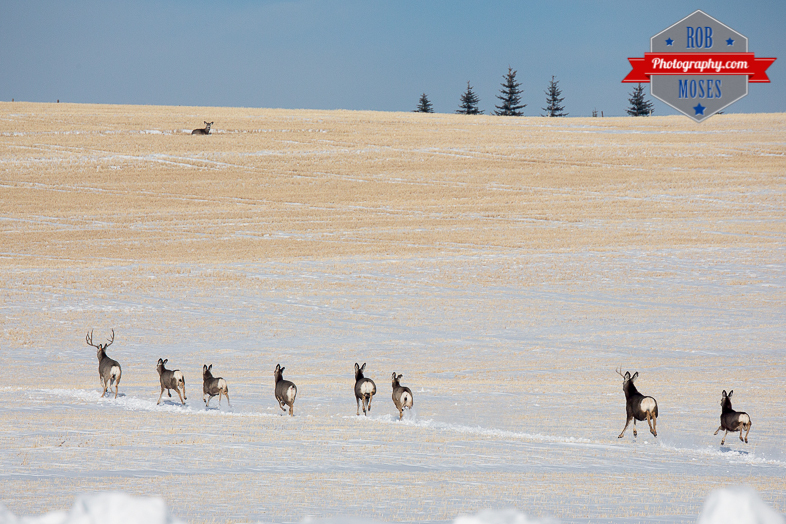 While I was driving I noticed a group of Elk & Deers on the side of the road up a hill, however they were to far to get a good picture, since the longest focal length lens I had on me was a Canon 70-300mm DO IS. Then about 50 yards down the road on the other side I noticed another group of Elk/Deer grazing a lot closer and to top it off there was a place for me to pull over! I quickly pulled in and grabbed my camera which was sitting on the seat next to me, jumped out and started shooting. I started whistling at them in the hopes to get a little action out of them. One of the deer didn’t like the whistling much at all and started running for it! The next thing I knew they were all bouncing across the field toward the fence, and once they got there they just started leaping over it like it was nothing! Amazing, to say the least. I grabbed a few more shots as they ran up the hill to joint their pals and then I hopped back in my car and drove back to the city. Sometimes living in Canada aint all that bad ;). This entry was posted in Nature, Random and tagged 5D mark iii, 5D3, 5Diii, 70-300mm, adult, Alberta, amazing, animal, baby, bambi, beautiful, big, building, buildings, Calgary, Canada, canadian, Canon, city, country, crazy, deer, DO, DOF, elk, fence, IS, jump, jumping, little, natural, nature, photo, Photography, pretty, random, run, running, sky, Skyline, skyscrapers, small, Snow, wild, wildlife, winter, wow, yyc, zoom. Bookmark the permalink. Apparently the Farmer is putting some corn down for them which is great, The Bull Elk jumping the fence is a super action shot. Hell, I’ve got more snow on the ground here in Ohio than you do there. Enjoy your photography. Thank you! Ya seems like everyone has been having one heck of a winter this year! Thank you for stopping by here and for your comment. Great shots, especially the second and final one. I’m pretty sure those are whitetail deer. Elk are significantly heavier. Thanks Dan! I will have to take your word for it, as I am sure you know by now I am not much of a woodsmen haha. These are wonderful. Great shot of them jumping the fence. Fantastic images, Rob! The one with the deer going over the fence awesome! The final image reminds me of a scene from a western film. Thank you Mike! And I agree about the last image now that you mention it haha. So beautiful- fantastic shots! And wow- that’s a really big buck. We get a lot of deer here at our house. Very rare to see a buck that large out of the woods. So cool! The last photo tells a story about group dynamics! For sure 🙂 Thanks for stopping by! Wow beautiful shots Rob! I love when those moments happen and they get captured. Thank you very much Deborah! Me too! ;). What an awesome shoot, you have been lucky (and alert :D)! Yes I have, and thank you ;). 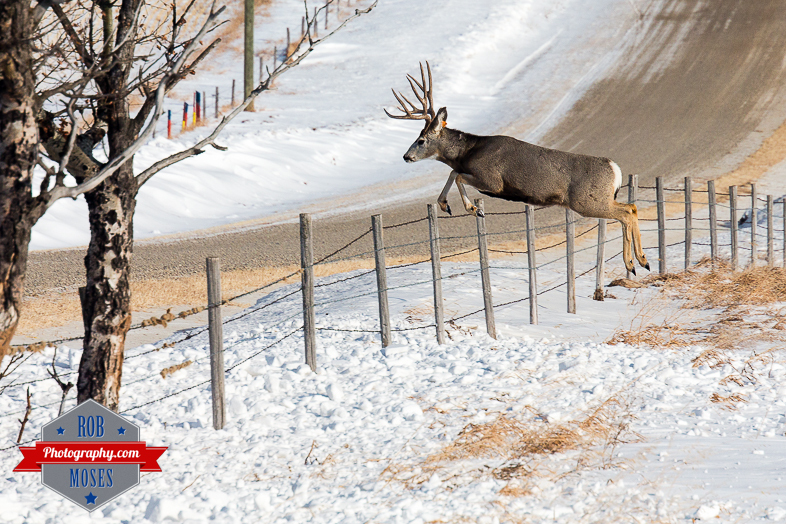 awesome captures Rob…love the photos of the deer jumping the fence! wow! I wish to see such beauty myself! you’re so lucky to be a part of this wonderful Mother Nature show. 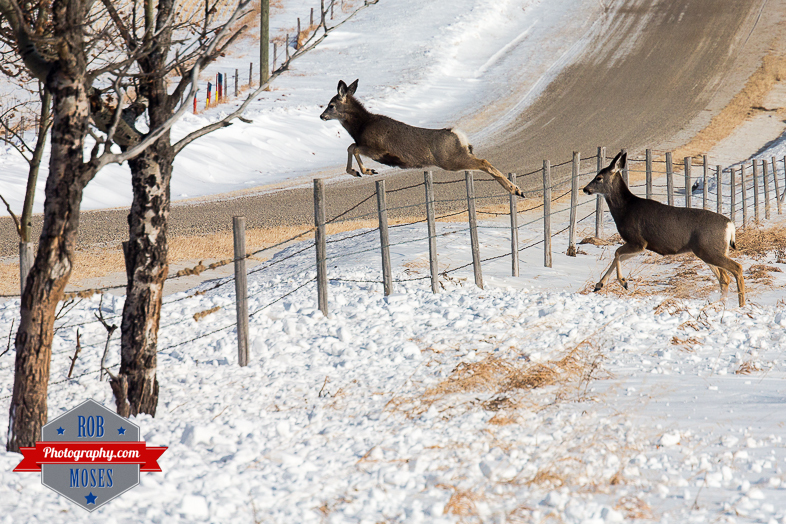 And it’s great that you managed to get such a great shot of the deers jumping! Thank you and no problem ;). Great shots. Am surprised, however, that a whistle would startle the head honcho so easily. You must have put some force behind it to get them to stop eating much needed food in the dead of winter.